Some scammers probably thought they struck gold when they bought the expired domain name of an old satirical fake news website. It seems their plan was to put up a copy of the old articles using the exact same links and then profit from the residual social media and search engine traffic. The domain name used to point to IP address 198.71.233.19 but now directs visitors to 45.252.248.18 where they are greeted by a front page that definitely has a different look and feel (check the old one here) but which appears to contain several stories that used to be present on the old site. The slogan "We spell it wrong cuz it's funnier that way" was also a staple of the old site. 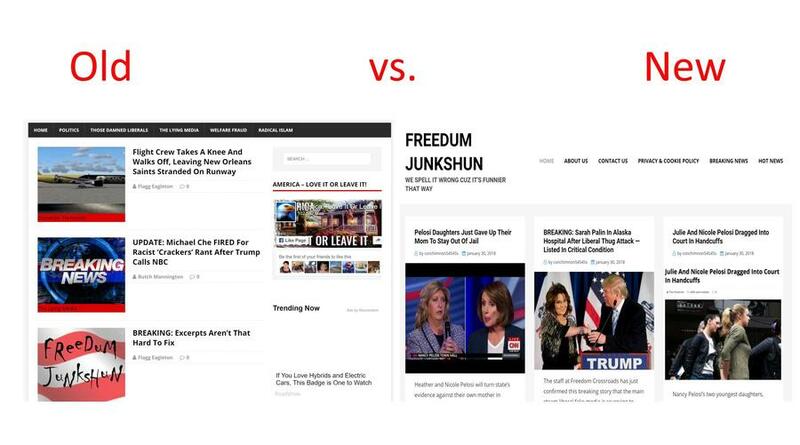 Freedumjunkshun.com used to be a satirical fake news website and the fake stories posted on it often got copied verbatim by various "real" fake news websites that didn't carry a satire disclaimer. This led to the eventual blocking of the site by Facebook back in November 2017: it was made impossible to share links from the domain on Facebook leading to the eventual shuttering of the site. The previous owner and main writer of the site is self-professed liberal troll Christopher Blair, a man from Maine who has made it his full time job to troll gullible conservatives and Trump supporters into liking and sharing his articles. He runs several other websites such as ladiesofliberty.net, shareotonin.com and dailyworldupdate.com. Sometimes he is also known under his nickname "Busta Troll". He has at least one accomplice who writes under the pen names "Freedom", "Captain Jellypants", "Butch Mannington" or "Captain Buck Atlantis". Sources close to Blair's operation have confirmed to Lead Stories that he let the domain name expire somewhere in December of 2017. It was apparently bought by someone using the name '"Ky Vu An" claiming to live in New York according to WHOIS information. We were unable to confirm that the address exists and the phone number doesn't appear to be real either.